The third installment of the Montreal Ska Festival, which is quickly establishing itself as the premiere ska event in North America, will kick-off from October 13-15th with a diverse line-up of bands from across Canada, the U.S. and Europe. The festival will feature headlining sets from 60's Jamaican ska icons The Skatalites, and long-running New York ska warriors The Toasters who will be performing as part of their 30th anniversary tour celebrations. Other acts set to perform include Mr T-Bone from Italy, Eastern Standard Time and Void Union from the U.S. and Danny Rebel & the KGB, The Hanger, and the Fabulous LoLo from Canada. The shows are well planned, affordable and well attended and Montreal is easy to get to from anywhere across the northeast of the U.S. as well as Quebec and Ontario in Canada, which should motivate any of you ska fans still sitting on the fence about attending this three day affair a reason to attend. 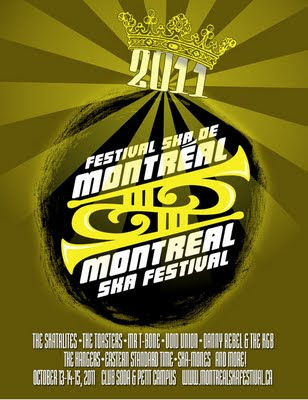 In fact, my fellow ska blogger Steve Shafer (The Duff Guide To Ska) and I are trying to make it up to Montreal for this. Hope to see a few of you there! Below is a video recap of the 2010 festival. You will defenetly see me there. I don't get alot of days off from work, but this is one thing i have to see. Last year was great, and now this year with Skatalites and the Toasters, things just keep getting better.